Aquarium UV Sterilizer Combinations . 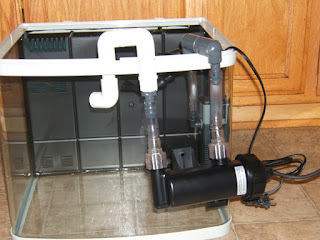 In part one about 18 months ago I noted using intake and return adapters as another way to connect UV Sterilizers to aquariums, especially smaller aquariums where the use of more traditional set ups such as canister filter or sumps is not possible. In this article I will expand on this idea and as well note some problems with many sump set ups and with the growing popularity of internal UV Sterilizers, which although they make work, they are prone to leak problems that usually result in a short lifespan. First I will start with the use of power heads, pumps, or Internal Filters (which is my first choice do to pre filtration of water allowing for a more effective UV Sterilizer). Here is a basic picture for plumbing a compact UV Sterilizer using an Internal Filter or Power Head. The lines and UV can be more neat than the diagram shows (this is just for emphasis). This demonstration is shown on the front of the tank for easier viewing, obviously this would be placed on the back of an aquarium. You may also place your power head/ internal filter on its side for an easier tubing application. The picture can be enlarged by clicking on it too! The advantage of this set up is that it allows a small (or larger aquarium) that may only have a HOB filter such as a Whisper to also have a UV Sterilizer PLUS more filtration and filter redundancy. In all bluntness, this type of set up is not all that expensive when you consider the costs of fish and medications or simply piece of mind that a UV Sterilizer can provide in improving water quality (such as Redox) and lower water borne disease incidence. This is not to say that a UV Sterilizer will solve all your problems, but they are often a major piece of the good water parameter puzzle and in my experience should be included in most aquarium set ups if at all possible. Here is a picture of an inexpensive set up that is ready to go for an aquarium as small as a 10 gallon aquarium, as well as a set up with a 9 watt Compact UV that would easily work for a 100 gallon aquarium. Similar to the above ideas, many UV Sterilizers, such as the Custom UV Sterilizer pictured to the left, can be hung on the back and then connected to an Internal Filter such as the SunSun Internal Filter or other similar Internal Filters for a simple UV application, especially when a canister filter is not available or practical (or even desired). A popular use of UV Sterilizers is in the sumps of high flow sump systems of large aquariums (especially marine), unfortunately the majority that I have seen when called out on service calls were installed improperly often resulting in the owner of the system to pronounce the UV Sterilizer a "failure" when in actuality the flow rate was way to fast for the UV Sterilizer wattage installed. As a generalization it is best to have a flow rate of under 20-30 gph per watt for a UV to be effective for bacteria, Redox, algae (slower yet for parasites) This flow rate can vary based on many factors that I will go into here (I recommend reading the link earlier in this article for more on this subject), I will only state that although you do not need to pay a fortune for a UV Sterilizer, most of the units selling for under $50 are junk and even a few name brands selling for over $100 are not delivering what you pay for. UV Sterilizer Diverter Valves are the answer to most high flow pump problems. For use with ponds, sumps, or any high flow water application where the flow rate exceeds the recommended GPH per watt so as to divert/bypass some of the water around the UV Sterilizer. With the above kit or similar in mind, please be careful of the relatively new Internal/Submersible UV Sterilizers sold under a couple of brand names (same design) BUT REJECTED by several wholesalers and retailers due to the fact that they tend to leak internally damaging and destroying the electrical components of the Unit often resulting in complete failure in under a year. As well, while these UV Sterilizers did perform a good job at clearing "green water"/Clarification (while functioning), in tests these UVs did a poor job of performing Stage One Sterilization due to flow pattern and distance from the UV Bulb/Lamp inside the unit. Level one (stage one) UV Sterilization is essential if you would like to step up in Aquarium or Pond Disease prevention by not only killing disease pathogens, but improve Aquarium Redox which also in turn improves fish health by improving fish immune response. I personally rejected these units (The Green Killing Machine) after Kokaho Aquarium and other users of these Internal/Submersible UV Sterilizers found total failure of most or all of them within a year or often much sooner. What is even worse is that a manufacturer of the most popular of these internal UVs had someone spam my YouTube video demonstration of how to install a custom UV on an aquarium using Internal Filters. I then commented on their clear attempt to push this product that I in good conscience could not recommend (in fact I noted in my comment that it was an awesome idea, which it is, but failed in practicality). They had the audacity to call ME unprofessional implying that I had gone to their Video when in fact that were trying to peddle their product via a comment on my video. They also ended up with name calling when they could not change my mind stating that "I needed help". Honestly in my opinion this is an act of desperation by a company that may have a good concept, but is failing to sell many due to the fact that many in this industry but for a few less than honest retailers refuse to stock these Internal UV Sterilizers (or "algae/green killing machines"). In the case of internal UV Sterilizers I would have loved for these to work, as I think this is a good idea, but I cannot honestly sell something that I know has flaws that will lead to product failure somewhere down the road as well as not being a true UV Sterilizer, rather just a water clarification device. If this idea appeals to you, avoid the before mentioned Submersible UVs along with similar models such as the Submariner sold at PetCo, Amazon, TruAqua and elsewhere and give the only one of a couple Submersible UVs I have found to be both reliable and able to actually provide level one UV Sterilization. I'm one of those hobbyist who is wondering how to install UV Sterilizer on my pond if ever i will buy one. thanks for the guide! I want to use a v2 vecton uv/c sterilizer on my 50 gallon. I don't want to plumb it through my flu Val g3 as flow rate is okay as is. So, can I use a Aquaclear model 30 175gph with an Aquaclear quick filter attached to provide turbidity control. Of course the power head would be fully submerged, about 4" from bottom and oriented horizontaly. Would this have enough oomf to push the water out of the tank and through the V2 vecton mounted at bottom of tank level ( 21" down ) and then push the water 21" back up and retuen to tank? As long as it has the head pressure, likely with the Vecton hung on the back using plumbing return connections (such as sold via AAP), this should work. Thank you! I will go there for more answers. I figure the flow rate of the aquaclear powerhead will be degraded enough from traveling through the V2 vecton and then being pushed back up 21" to maybe give me level 2 sterilization. For sure level one though I assume. Thank you again.